Did you just bought a home with a swimming pool? Or just finished installing one in your new home? If yes, you're on the right track! But have you considered making it different from what you see everywhere? Or better still, completing it with jaw-dropping add-ons and features? The thing is, with the right design creativity, today's modern features and of course, the right Sacramento swimming pool contractor, the possibilities are endless! Sac Pool Pros boast an extensive collection of exceptional features that can transform the looks of your pool and increase its aesthetic appeal. 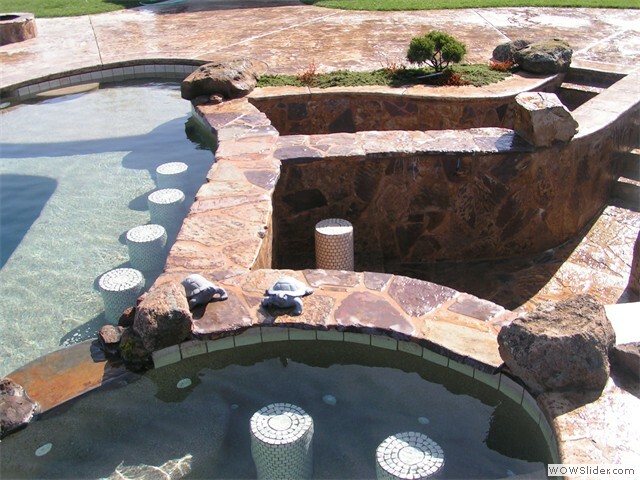 Homeowners will get to choose from our wide selection of custom pool features including waterfalls, slides, water jets, interior and deck finishes, grottos, mosaic accents and more. At Sac Pool Pros, we take our time to design these features and our attention to detail ensures that the project exceeds your expectations. Love the idea of taking full advantage of your pool day and night regardless? If yes, you won't be wrong to add high-quality lighting to the mix. Pool lighting gives your swimming pool a captivating new dimension when the sun goes down thus creating a perfect nighttime paradise that you're sure to love. With today's technology, you can enjoy a number of lighting options including standard white lighting, multicolored and fiber optics. Essentially, you'll want to stick with fiber optic lighting if you're looking for a great way to illuminate the pool and provide a variety of colors all night. At Sac Pool Pros, we stock a full lineup of Jandy pool lights all which are sure to bring a palette of colors to your backyard oasis for a beautiful and super fun nighttime poolscape. What's more, JandyColors are engineered in such a way that the vibrant colors create beautiful sparkling ripples on the surface — it's just perfect for you and your family. Set to transform your pool into an enchanted resort that leaves everyone in awe? If yes, reach out to a swimming pool builder Sacramento and add that dramatic, mysterious effect on your pool's design. At Sac Pool Pros, we can use our years of experience to create a romantic getaway or even a spot for pirate's treasure in your own swimming pool. With just rock and boulders (natural or man-made), we can transform the edge of your backyard oasis into a fascinating tropical wonder. Besides adding an exotic, tropical element to your pool, grottos also offer your family a unique spot to sit and cool off after a fun time in the water. Be sure to reach out to discuss the endless design possibilities — creativity is your only limit! How about breaking free from the regular swimming pool entries you've seen all these years? Complete your pool with a beach entry and allow your family to enjoy that beach feeling at home. Beach entry is one of the popular options that allow homeowners to make a big switch to a more natural design. As the name suggests, this custom feature imitates the manner in which a beach gradually descend into the ocean waves. Beach entry is designed with a deck that gently slopes beneath the surface and increase in depth as you move forward — it starts out at zero and gradually slopes to a depth of one foot. Sac Pool Pros can also help homeowners incorporate Acapulco or Baja shelf into their swimming pool. This add-on is basically an oversized step that allows you and your family to stand within a few inches of the water — just close enough to get your feet wet. The big idea is to give you the chance to sit and splash around without getting totally immersed in the water. How about transforming your pool into an infinity vanishing edge backyard oasis? There's no doubt that this impressive feature will stun your friends and get the neighbors talking. For the most part, infinity pools give the impression that the edges of the pool disappears and merges into its natural landscape — it's simply amazing. If you're interested in this jaw-dropping feature, you'll be glad to know that our team can make your dream come true. Our customizable negative edges are sure to work great for any backyard, but it even gets better if your home is located near a beach or lake. Don't hesitate to request a free estimate today. Our professional team can also work with you to Increase the aesthetic value of your pool — we have dozens of mosaic tiles that can liven things up and make it beautiful. Sac Pool Pros stock a full range of tiles, all of which come in different shapes and sizes that are sure to appeal to even the pickiest of homeowners. When you engage our services, we will help you choose the right mosaic tile for you and proceed to create a large centerpiece that is you are sure to love. Do you want to add cozy warmth to your outdoor space? If yes, you will be happy to hear that Sac Pool Pros go beyond designing your pool's edge; we also boast the experience of crafting exceptional fire pits and outdoor fireplaces. If you're among the many homeowners who enjoy the opportunity to gather family and friends around a cozy campfire at the backyard, then you'll be glad to know that Sac Pool Pros can make your dreams come true. We can build a firepit of any shape or size and ensure that it appeals to all — contact us today to get your project started!